If you've only listened to Clapton in the eighties and since - listen to this! It won't suit your dinner parties or mood music, it's rock for a load of beers and memories. If you've got a half decent sound system, crank it up, feel the bass, drums and love the guitar. Baker's steamrollering drums, never missing a beat and indeed inserting beats where before now you would think no beat should be. Jack Bruce, now; fractured but soulful voice (listen to the menace in 'Tiny purple fishes run laughing through your fingers, you want to take her with you to the heartland of the winter') and changing from dark to light from one line to the next; and bass playing that pushes your speakers to their limits, again throwing in off-beats and half-a-tone out grace notes that fit, incongruously, where no note should. And then Eric. Towering, violent, mighty power chords punctuated with fills and riffs from out of the ether, again in perfect time and synchrony with Jack and Ginger. There's a symbiosis here, all three playing to within an inch of their lives and flooding us with sheer unadulterated artistry. And as for 'Steppin Out', which has been held up as a self indulgent parody by some: this is a source book of EXACTLY how to play your balls off. From the initial 'Right you are' we know Eric means business, and by god he certainly does. Every trick in the book is pulled here and several Eric made up on his own. The transitions between licks, phrases and colour are made freely and the final couple of minutes are pure sustained aggression with no quarter given. All guitar players should be made to listen to this and learn how to build a solo. It's all there. Brilliant! 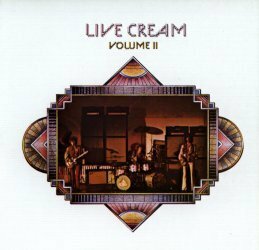 Of all the albums (by Cream or not), this is the best! It captures a spirit of the band and a live show wonderfully. From the opening chords of Deserted Cities of the Heart to the poetry of Tales of Brave Ulysses and onto the infamous opening riff of Sunshine of Your Love and closing with the amazing skill and dexterity shown by the band in the phenomenal 14 minute improvisation lead by Eric Clapton. This album is truly a modern masterpiece! !